Modi had said, "People with big surnames came to power and went but no solution could be found to problems." 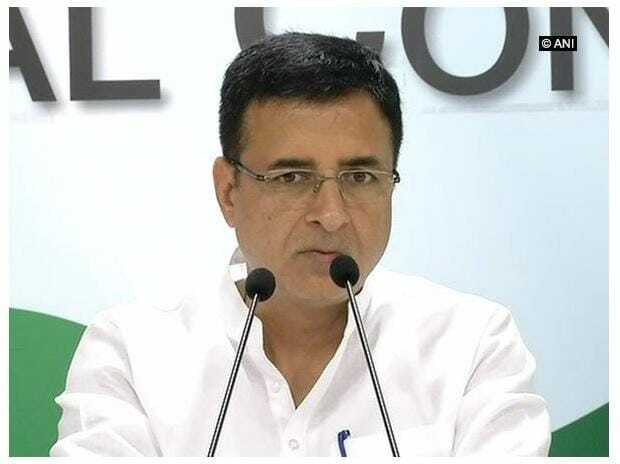 Congress' chief spokesperson Randeep Surjewala dismissed the prime minister's remarks as "baseless"
The Congress Friday hit back at Prime Minister Narendra Modi for his remarks that India could not prosper despite people with "big surnames" ruling the country, saying he could not mislead the people by "lying" as he had been "exposed". Addressing the 'Jagran Forum' organised by the Dainik Jagran media group, Modi had said, "People with big surnames came to power and went but no solution could be found to problems." He was making an oblique reference to the Nehru-Gandhi family. Congress chief Rahul Gandhi took part in 82 public meetings and a dozen road shows. He held press conferences in almost all the poll-bound states, Surjewala said. The Congress spokesperson alleged that the prime minister and his leaders used abusive language. "I will have to say that the PM's behaviour was shameful and condemnable," he said.